Nothing Lumen won’t be able to fix with the power of photography, however! Or I’m hoping that’ll be the case at least, seeing how for some reason, her ridiculously hi-tech ‘camera’ has the ability to literally ‘freeze frame’; by which I mean that… it can be used to lock objects in place. Ah, imagine the possibilities, even if the tech is limited to inanimate objects. At least that’s what my testing showed. Maybe that’ll change past the point where the demo ended? Maybe it won’t. Probably won’t. Even so, it is incredibly useful, being able to manipulate the environment like this. On top of that, the camera can also be used to draw out light from various sources, creating solid lines from thin air. I know, sounds super weird, but it works great for crossing large gaps, among other things. Just keep in mind that you’re limited to what fits inside the frame, and only one picture at a time; in case you were planning on wreaking havoc across an entire level at once. Not gonna happen. Oh, and when you’re not busy drawing white lines or working on furthering your career as a photographer (not really a thing in the game (or is it…)), why not chat up some of the locals at Paradise 252-B? If you thought the place itself looked strange, wait until ya get to conversing with… well, just about anyone. That said (get it? ), there are those who might be able to help you along with a nod in the right direction or some such. If you can find them. Now, thanks to that lovely camera (or whatever that thing actually is), Lumen is able to do seemingly impossible things, go places perhaps not meant to be explored. 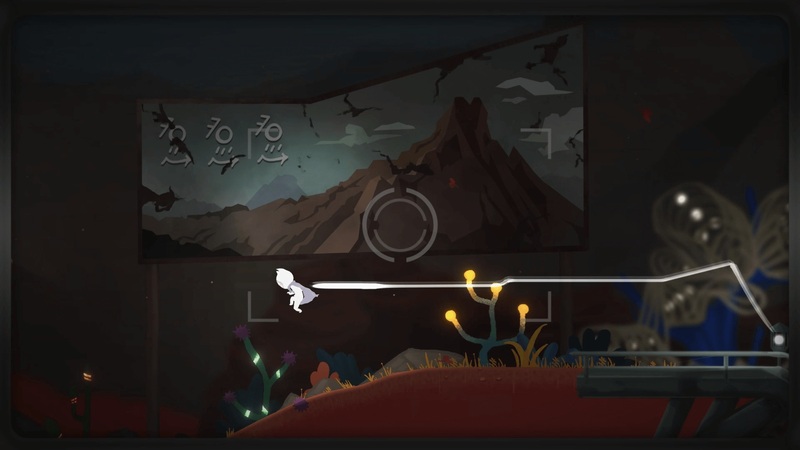 In other words, From Light is a bit of a puzzle platformer, and based on the demo, a pretty darn interesting one at that. Whether I was sliding boxes back and forth, opening doors or something else entirely, to move things along, smooth sailing across the board. I mean, there were a few head-scratchers, but nothing that had me downright stumped – and I’m generally pretty bad at puzzles! That said, as is often the case with demos, From Light‘s ended just as it was starting to get interesting. So darn typical. What makes it even worse one is that no one knows when the finished version will be out! As such… why not take it for a spin, see for yourself what my rambling’s all about?